In urban territories, solar energy and heat are absorbed to a greater extent than in rural areas, thus reducing the evapotranspiration and creating warmer environments. Consequently, the energy demand for cooling is expected to grow strongly with climate change. 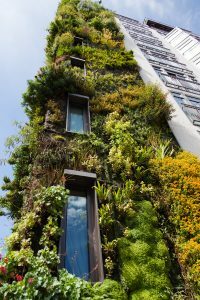 However, in many cities there is a potential for cooling urban microclimates through adding vegetation and trees and greening roofs and city areas. This will not only help to save energy, it will also be beneficial to the health and quality of life of city dwellers. With respect to biodiversity, human pressure and climate change have generated severe disturbances. There is an urge to apply effective protection strategies to priority conservation areas. In Inner Mongolia, for example, an ecological restoration plan was initiated, focusing on climate change mitigation and adaptation, vegetation restoration and protection, technological innovation, etc., while addressing sustainable development and communities’ wellbeing. Furthermore, there is a great interest in the impacts of climate change on water security over time. As land is degraded and converted for human use, water ecosystems lose their ability to filter and store water. Therefore, we must rely on costly built infrastructure to deliver sufficient clean water. However, there is an opportunity to address water security risks by investing in source watersheds through conservation activities and improved land management. Benefits will include savings in water treatment, climate change mitigation and adaptation, biodiversity conservation and human health. In conclusion, there are many areas for future research on this theme, including the additional effects of nature-based solutions such as positive aspects on human health. Consequently, further studies and strategies are needed to influence local leaders’ decisions concerning climate change mitigation and adaptation programs.